Fiddes Teak Oil - Goosebay Sawmill and Lumber, Inc. Application: Two coats are recommended on bare wood, applied 24 hours apart. Use a brush or cloth to apply. Remove excess product with a fresh cloth. 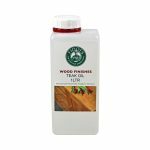 Maintenance: It may also be used as a renewal coat over Fiddes Danish Oil, applying one coat yearly. (Observe safety precautions for the proper disposal of oily rags.) May be used over most other exterior finishes, but always test for compatibility. Note: Teak Oil’s long curing time (6-8 weeks) makes it useful as a renewal coating over seasonally used items such as outdoor furniture.